Cell-adhesiveness is key to many approaches in biomaterial research and tissue engineering. A step-by-step technique is presented using wet-chemistry for the surface modification of the important polymer PTFE with peptides. Gabriel, M., Niederer, K., Frey, H. Wet Chemistry and Peptide Immobilization on Polytetrafluoroethylene for Improved Cell-adhesion. J. Vis. Exp. (114), e54272, doi:10.3791/54272 (2016). Endowing materials surface with cell-adhesive properties is a common strategy in biomaterial research and tissue engineering. This is particularly interesting for already approved polymers that have a long standing use in medicine because these materials are well characterized and legal issues associated with the introduction of newly synthesized polymers may be avoided. Polytetrafluoroethylene (PTFE) is one of the most frequently employed materials for the manufacturing of vascular grafts but the polymer lacks cell adhesion promoting features. Endothelialization, i.e., complete coverage of the grafts inner surface with a confluent layer of endothelial cells is regarded key to optimal performance, mainly by reducing thrombogenicity of the artificial interface. This study investigates the growth of endothelial cells on peptide-modified PTFE and compares these results to those obtained on unmodified substrate. Coupling with the endothelial cell adhesive peptide Arg-Glu-Asp-Val (REDV) is performed via activation of the fluorin-containing polymer using the reagent sodium naphthalenide, followed by subsequent conjugation steps. Cell culture is accomplished using Human Umbilical Vein Endothelial Cells (HUVECs) and excellent cellular growth on peptide-immobilized material is demonstrated over a two-week period. Various polymers used in medicine that have been approved for some time do not exhibit enhanced biocompatibility, i.e., lack of cell-adhesiveness, induction of fibrotic encapsulation and thrombogenicity, to mention a few. Interactions between the biomaterial and the biological system takes place mainly at the surface of the implant. As a consequence, research has focused on surface modification in order to create appropriate properties for a desired application while leaving the bulk properties of the material unaffected. Polytetrafluoroethylene (PTFE) as a physiologically inert polymer is used in many medical fields such as hernia surgical mesh 1, medical ports 2 and, most importantly, vascular grafts 3. Especially in blood contacting situations the hydrophobic nature of PTFE causes unspecific adsorption of plasma components and as a consequence platelet adhesion, often resulting in thrombotic events and occlusion of the graft 4. Furthermore, PTFE, like most polymers, does not support cellular adhesion and coverage which would be a desirable feature to induce the formation of a beneficial layer of endothelial cells (ECs) on the inner (luminal) surface of the vascular graft 5. A biomimetic endothelium is expected to fulfil many of the functions of its natural equivalent, notably its antithrombogenic properties 6. A general biomimetic modification strategy is based upon the concept of exclusively endowing the material with cell-adhesiveness while leaving the materials bulk properties unaffected. 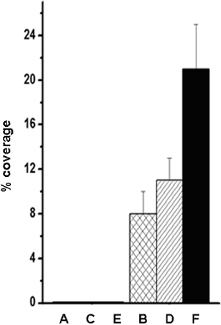 In addition, platelet adhesion may be reduced by incorporating anti-adhesive (anti-fouling) attributes 7. Various peptides — mostly derived from proteins of the extracellular matrix — have been described that strongly enhance cell-adhesion by binding to cellular receptors, belonging to the class of integrins 8. The best-known example in this regard is the peptide Arg-Gly-Asp (RGD) that interacts with most cell types. Other amino acid sequences are recognized by integrins exclusively expressed on specific cells. For example, Arg-Glu-Asp-Val (REDV) and Tyr-Ile-Gly-Ser-Arg (YIGSR) have been found to bind to ECs in a specific manner 9. Covalent immobilization of such peptides has been carried out on a plethora of inherently non-adhesive materials including metals and polymers 10,11. Porous PTFE, more precisely expanded PTFE (ePTFE) — along with polyethylene terephthalate (PET) - is the most important material for the production of vascular grafts 12. Established physical techniques for appropriate treatments, such as plasma modification 13 or by photochemical methods 14, are hampered by the fact that porous and/or tubular structures are not readily treatable inside the pores or the lumen respectively. Wet chemistry on PTFE is a difficult task because of the highly inert nature of the fluorin-containing polymer that resists most chemical attacks 15. In this paper we describe a comparatively facile method for a covalent modification strategy. Adapted from a procedure to render PTFE bondable, functional groups were created on the materials surface that serve as anchor points for further conjugation of biologically active molecules. Note: Carry out reactions in a well-ventilated fume hood. Follow general rules for handling highly flammable solvents and corrosive metals like metallic sodium. Naphthalene has a very unpleasant smell (mothball), even in very small amounts! If not indicated otherwise reactions are performed at room temperature. Sodium azide is highly toxic! THF (99.9%, see List of Materials) was stored over approximately 20% (by volume) molecular sieve. Distill THF with a noticeable water content over sodium. The formation of sodium naphthalenide does not occur if trace amounts of water are present. To a solution of 1.4 g (10.9 mmol) of naphthalene in 20 ml tetrahydrofuran (THF, dried over 3 Å molecular sieve), add 0.25 g (10.9 mmol) sodium metal in a screw-capped 100 ml glass bottle equipped with a PTFE-coated magnetic stirring bar. Note: Dissolution can be greatly enhanced by cutting the sodium into small pieces and modest heating (35 - 40 °C). The final solution has a dark, slightly greenish color and may be stored under strictly dry conditions. Punch out PTFE discs of 12 mm diameter from 0.5 mm thick foil material. Mark one side (e.g., using a letter stamp punch) and clean with iso-propanol. Incubate PTFE-samples individually in the activating solution (step 1.1) for 1 - 2 min using forceps. Note: The color change from white to dark brown indicates successful treatment. Subsequently rinse twice with THF and then with iso-propanol. Note: The naphthalenide solution is exhausted when its color changes to a watery light brown. Unused naphthalenide solution (possibly containing metallic sodium) has to be decomposed by slowly adding iso-propanol prior to disposal. Oxidize treated samples in hydrogen peroxide (30%) containing 20% (w/v) trichloroacetic acid for 3 hr. Wash with water and dry. The surface now has a slight brownish appearance. Note: Activation and oxidation result in a drastically increased wettability of the surface. This finding was examined in detail previously 14. Treat oxidized discs with 50% (v/v) hexamethylene diisocyanate (HMDI) in dry THF for 2 hr, rinse with THF and leave to dry. Hydrolyze isocyanate bearing samples in water for 2 - 3 hr and dry. Note: The final amino-functionalized PTFE surface is far more stable than the isocyanate-bearing samples and is compatible with many standard crosslinkers for further coupling. Prepare a solution of 20% (v/v) diethyleneglycol diglycidyl ether (diepoxide) in 50 mM carbonate buffer, pH 9. Place the aminated discs with the marked side up individually into a 24 well plate and add 1.5 ml of the epoxide solution. Ensure full coverage of the samples. Incubate for 2 hr and wash two times with water and once with carbonate buffer. Add 50 µl of a 0.5 mg/ml peptide (e.g., REDV) in 50 mM carbonate buffer, pH 9 containing 0.01% NaN3, to the bottom of individual wells of a fresh 24 well plate and carefully place the epoxy-functionalized discs upside-down (i.e., marked side down) onto the drop of the peptide solution. Make sure that the space between the bottom of the well and the PTFE disc is completely wetted due to capillary action. Incubate in a wet chamber (e.g., any sealable plastic box with a tight closing lid) with humidified atmosphere (by placing wet tissue paper on the bottom) for at least 3 hr or overnight. Note: Albeit the REDV motif may be regarded as well-characterized, a scrambled or reverse amino acid sequence may be included as an additional negative control. Wash three times with water and sterilize in 50% iso-propanol/water for at least 30 min. Prior to cell seeding, rinse the samples in sterile phosphate buffered saline (PBS). Grow HUVECs using standard cell culture procedures 17,18. Place the peptide-conjugated samples with the modified side up in a 24 well plates. Use untreated PTFE discs as a control. Seed 5 x 104 HUVECs in 2 ml medium per well and incubate for 4 hr at 37 °C and 5% CO2 in an incubator. Remove the discs, rinse carefully to remove unattached cells and transfer to a fresh 24 well plate. Add 2 ml of fresh medium and incubate for the desired period (e.g., 24 hr, 1 w, etc.). Change medium every two days. Prepare a stock solution of 1 mg/ml Calcein-AM in dimethyl sulfoxide (DMSO). After growing the cells remove the medium, wash with PBS and add PBS containing 1 µl/ml Calcein-AM stain (e.g., 1 µl of a stock solution per ml PBS). Gently agitate and incubate at 37 °C for 45 min in the dark. Wash with PBS and immediately take micrographs on a fluorescence microscope equipped with standard FITC filters (Ex 488 nm, Em 515 nm). Use 100-fold magnification. Perform triplicates from unmodified as well as treated samples. Using ImageJ software determine the area colonized by the cells. Alternatively count the cells manually or use ImageJ. Both methods will give similar information about the attachment and growth of cells on the respective surfaces. 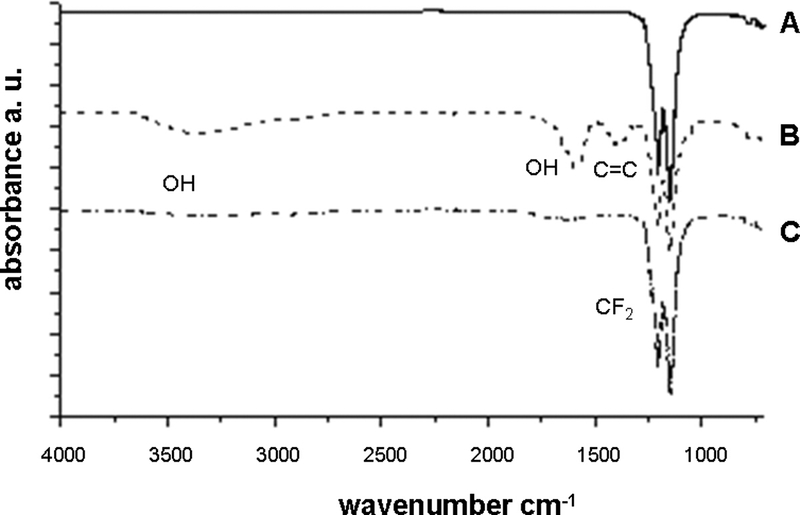 The results of the crucial chemical reaction steps were monitored by IR spectroscopy (Figure 1). The initial activation with sodium naphthalenide generates double bonds — and to a minor extent — OH-functionalities. The signal indicating C=C bonds disappear upon oxidation, yielding a surface bearing almost exclusively hydroxyl-groups. Analysis of further standard conjugation steps are not shown here. 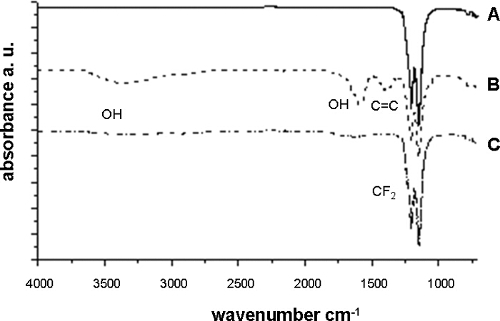 The color changes due to activation and oxidation are in agreement with the expected chemistry that is used: conjugated double bonding systems are expected to be brownish and its loss results in brightening (Figure 2). In addition, the possible outcome of activation and oxidation on the surface morphology was investigated by means of scanning electron microscopy. Virtually no detrimental effect of the treatment was observed (Figure 2). Figures 3 and 4 show the outcome of REDV-immobilization on endothelial cell growth. Whereas virtually no cell adhesion and proliferation occurs on untreated material the modification strongly supports colonization over a two week period. Exemplified for a clinical application (i.e., vascular grafts), the modification was identically performed on original material from a commercially available graft made of expanded PTFE with a similar results over a period of one week (Figure 5). Figure 1. IR spectroscopy of PTFE. Treatment of pristine PTFE (A) results in the formation of double bonds and to a certain extent of hydroxy functions (B). Subsequently C=C bonds are reduced due to the oxidation (C). Please click here to view a larger version of this figure. Figure 2. Optical appearance of bare and surface activated PTFE. 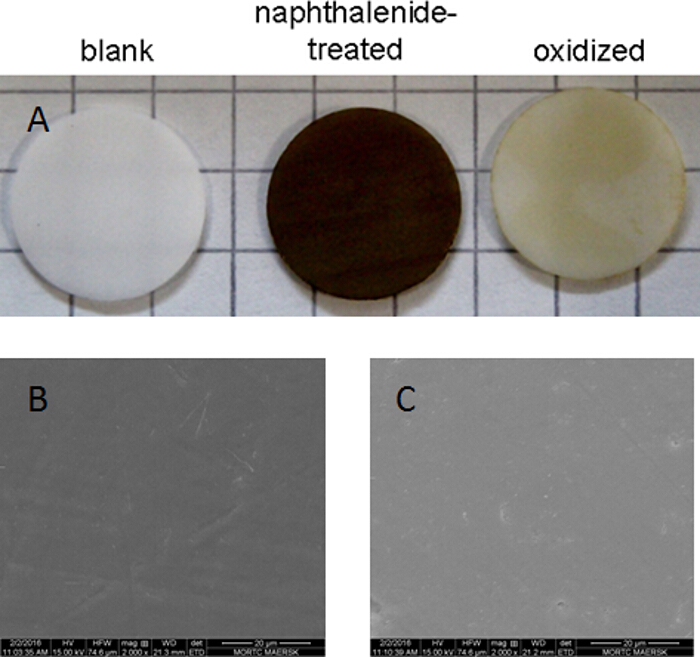 (A) Whereas untreated PTFE (left) appears white, the activation using sodium naphthalenide yields a dark brownish color (middle) which is slightly brightened upon oxidation (right). Untreated (B) and oxidized PTFE (C) samples were additionally investigated using scanning electron microscopy (magnification: 2,000X). Discs are 12 mm in diameter. Please click here to view a larger version of this figure. Figure 3. 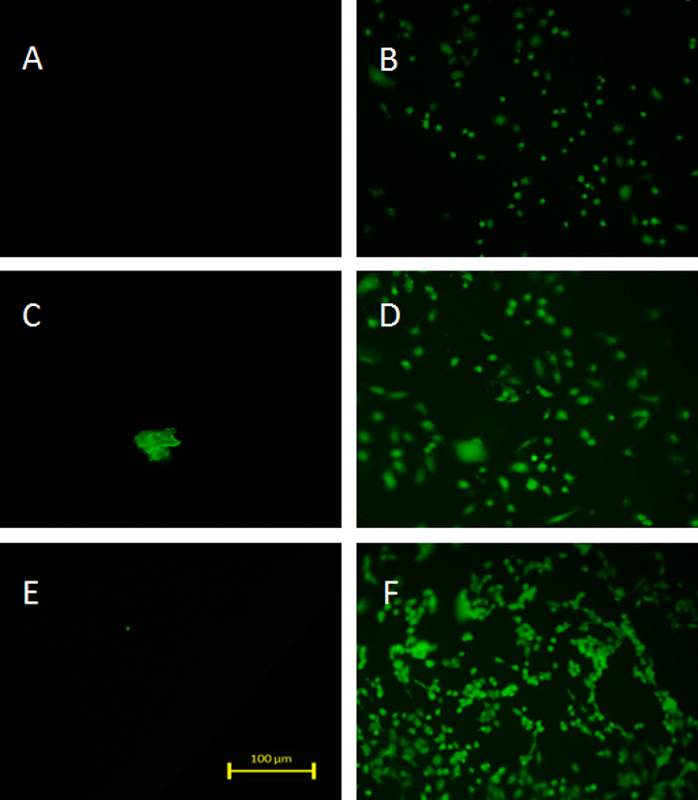 Endothelial cell culture on pristine and peptide-modified PTFE. Untreated samples are not colonized by ECs (A, C, E after 24 hr, 1 w and 2 w respectively) whereas adhesion and growth on peptide-modified material is greatly enhanced (B, D and F after 24 hr, 1 w and 2 w respectively). Scale bar: 100 µm, magnification 100X. Please click here to view a larger version of this figure. Figure 4. Quantification of cell coverage by ImageJ analysis. 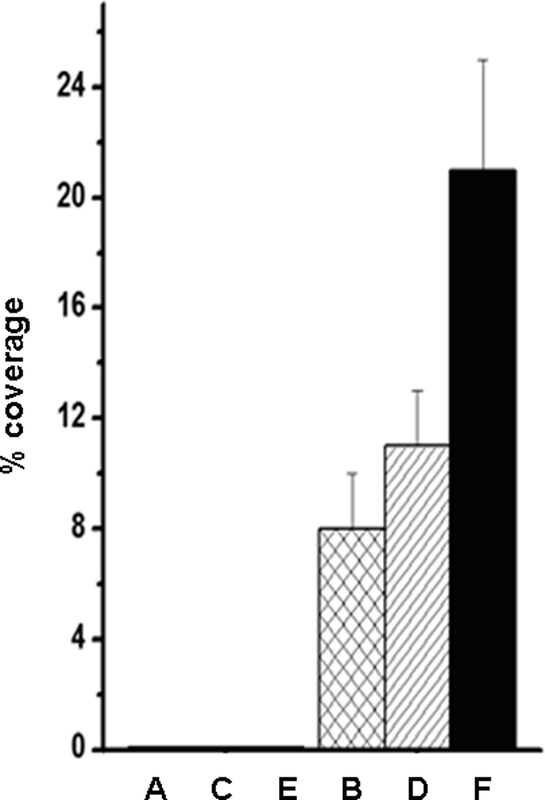 Cellular growth on bare PTFE (A, C, E) and on REDV-conjugated polymer surfaces (B, D, F) expressed as percentage coverage of total area. Immobilized peptide clearly enables initial adhesion (B) and supports colonization over a 2-week period (D, F). Triplicate determinations, mean ± standard deviation). Please click here to view a larger version of this figure. Figure 5. Endothelial cells grown for 1 week on expanded PTFE. The structure of ePTFE is shown using Scanning Electron Microscopy (A). The results obtained on porous material are in accordance with those obtained for flat PTFE specimen. In contrast to the few cells found on bare material (B) the modified surface (C) provides an excellent substrate for cell growth. Scale bars are 100 µm for A, B and C respectively. Please click here to view a larger version of this figure. Figure 6. Schematic representation of the chemical modification of PTFE using wet-chemistry. Double bonds generated by Na-naphthalenide treatment are oxidized resulting in OH-functionalities. A hydroxyl-reactive diisocyanate is then immobilized and hydrolyzed to an amine. Finally the bifunctional diepoxide is applied to conjugate the REDV peptide using the N-terminal amino group. Please click here to view a larger version of this figure. The detailed description of surface modification protocol of PTFE consists of successive steps starting with the elimination of fluorine from the polymer backbone as depicted in Figure 6. As a result, a layer is formed that contains an abundant amount of conjugated carbon-carbon double bonds in accordance with the dark brownish color that developed upon naphthalenide treatment. Standard oxidation with acidic hydrogen peroxide yields a hydroxylated surface accompanied by brightening to a pale brown, this reflects the loss of double bonds. This process is clearly evidenced by IR spectroscopy. In order to achieve a more generally applicable functionality, the pendant OH-groups were converted into amino-functionalities by simple treatment with a diisocyanate and subsequent hydrolysis of the NCO-moieties to primary amines. This is favorable, because amine-bearing material can be stored for prolonged periods whereas the highly reactive isocyanate is susceptible to the very presence of air humidity. Care must be taken in the avoidance of even trace amounts of water in the initial activation step and the HMDI treatment because both sodium naphthalenide and the isocyanate are highly susceptible to hydrolysis. In contrast to standard procedures in which the sample is completely immersed in the solution, the present protocol necessitates only small amounts of the reagent. Therefore this method saves a lot of the costly peptide. Amine-bearing surfaces are ideal starting points for the coupling of many biomolecules. The diepoxide employed in this work is interesting in several regards: it is comparatively cheap, hydrophilic, highly reactive towards amines and non-reacted epoxides are hydrolyzed in an aqueous environment into "physiologically inert" diols. Homobifunctional crosslinkers are suitable reagents where only one reactive group is present on the peptide to be immobilized. This applies for REDV containing only one single primary amino-group on the N-terminal (this is the same for the frequently used sequence RGDS). For peptides containing lysine residues (with side chain amines) the outcome of the conjugation is ambiguous, meaning that proper coupling does not occur in a defined way. In this case, a strategy using heterobifunctional crosslinkers (e.g., amine- and thiol-reactive) and cysteine (N- or C-terminal) containing peptides is helpful 18. The results of the peptide immobilization in terms of cell adhesion is unambiguous (Figures 3 and 4). Whereas virtually no cells adhere on bare PTFE, REDV-modification renders the material an excellent cell-adhesive substrate. Complementary to the above mentioned protocol preliminary work show that this technique is also applicable on porous (expanded) PTFE with similar results (Figure 5). This is of special interest because this is the material vascular grafts are made of. In contrast to surface techniques that mostly make use of plasma treatment (plasma activation 13, plasma polymerization 19), this protocol provides a guideline for the covalent modification of PTFE by employing readily available chemicals and lab procedures and by avoiding highly sophisticated equipment. Plasma methodologies such as reactive plasma (O2, NH3, etc.) and plasma polymerization are not applicable within porous constructs or tubing because reactive species (e.g., radicals) are not able to penetrate these structures due to inactivation upon contact with the materials surface. For example small caliber vascular grafts (diameter < 5 mm) cannot be treated in this way. In contrast to this, by means of wet chemistry, there is no restriction regarding the shape of the device. In this way, by enabling the formation of an endothelial layer on the luminal side of an ePTFE vascular graft, thrombogenicity and long term patency may be improved. In addition, a cell adhesive surface for surgical hernia meshes is supposed to result in better tissue integration. The authors would like to acknowledge the help of Walter Scholdei (Max-Planck-Institute for Polymer Research, Mainz, Germany. Doctor, H. G. Evaluation of various prosthetic materials and newer meshes for hernia repairs. J. Minim. Access Surg. 2, 110-116 (2006). Zaghal, A., et al. Update on totally implantable venous access devices. Surg. Oncol. 21, 207-215 (2012). Niu, G., Sapoznik, E., Soker, S. Bioengineered blood vessels. Exp. Opin. Biol. Th. 14, 403-410 (2014). Wang, M. -J., Tsai, W. -B. Biomaterials in Blood-Contacting Devices: Complications and Solutions. Nova Science Publishers. 1 ed (2010). de Mel, A., Jell, G., Stevens, M. M., Seifalian, A. M. Biofunctionalization of biomaterials for accelerated in situ endothelialization: a review. Biomacromolecules. 9, 2969-2979 (2008). Zdrahala, R. J. Small caliber vascular grafts. Part I: state of the art. J. Biomat. Appl. 10, 309-329 (1996). Cleary, M. A., et al. Vascular tissue engineering: the next generation. Trends Mol. Med. 18, 394-404 (2012). Ruoslahti, E. RGD and other recognition sequences for integrins. Annu. Rev. Dev. Bi. 12, 697-715 (1996). Lei, Y., Remy, M., Labrugere, C., Durrieu, M. C. Peptide immobilization on polyethylene terephthalate surfaces to study specific endothelial cell adhesion, spreading and migration. J. Mat. Sci. Mater. M. 23, 2761-2772 (2012). Gabriel, M., et al. Covalent RGD Modification of the Inner Pore Surface of Polycaprolactone Scaffolds. J. Biomat. Sci.. Polym. E. 23, 941-953 (2012). Ceylan, H., Tekinay, A. B., Guler, M. O. Selective adhesion and growth of vascular endothelial cells on bioactive peptide nanofiber functionalized stainless steel surface. Biomaterials. 32, 8797-8805 (2011). Chlupac, J., Filova, E., Bacakova, L. Blood vessel replacement: 50 years of development and tissue engineering paradigms in vascular surgery. Physiol. Res. / Academia Scientiarum Bohemoslovaca. 58, Suppl 2 119-139 (2009). Wise, S. G., Waterhouse, A., Kondyurin, A., Bilek, M. M., Weiss, A. S. Plasma-based biofunctionalization of vascular implants. Nanomedicine UK. 7, 1907-1916 (2012). Mikulikova, R., et al. Cell microarrays on photochemically modified polytetrafluoroethylene. Biomaterials. 26, 5572-5580 (2005). Gabriel, M., Dahm, M., Vahl, C. F. Wet-chemical approach for the cell-adhesive modification of polytetrafluoroethylene. Biomed. Mater. 6, 035007 (2011). Gabriel, M., van Nieuw Amerongen, G. P., Van Hinsbergh, V. W., Amerongen, A. V., Zentner, A. Direct grafting of RGD-motif-containing peptide on the surface of polycaprolactone films. J. Biomat. Sci.. Polym. E. 17, 567-577 (2006). Larsen, C. C., Kligman, F., Kottke-Marchant, K., Marchant, R. E. The effect of RGD fluorosurfactant polymer modification of ePTFE on endothelial cell adhesion, growth, and function. Biomaterials. 27, 4846-4855 (2006). Gabriel, M., Nazmi, K., Veerman, E. C., Nieuw Amerongen, A. V., Zentner, A. Preparation of LL-37-grafted titanium surfaces with bactericidal activity. Bioconjugate Chem. 17, 548-550 (2006). Lotz, A., Heller, M., Brieger, J., Gabriel, M., Förch, R. Derivatization of Plasma Polymerized Thin Films and Attachment of Biomolecules to Influence HUVEC-Cell Adhesion. Plasma Process Polym. 9, 10-16 (2012).